UMUSTBEBORED: COME TO THE WHITE ZOMBIE PREMIER!!! How cool is this? The fine talented crew of RagNbone Productions are having their premier for WHITE ZOMBIE on July 12, 2014 at the Twin City Opera house in McConnelsville, Ohio. Apparently the opera house is haunted so when you go there have fun but just don't get ghost on you. Trust me. You do not want to bring back some unwelcome guests into your home. Below is the link to their promo on THE YOUTUBE with more information. Premiers for horror movies at real haunted locations are the best. I worked on the web series SHADOW BOUND and we had the premier at the Pythian Castle where we shot some of the scenes for the show. It is a thrilling and unique experience to say the least. You do not want to miss out on that kind of opportunity. Check out RagNbones other feature THE HOUSE ON THE WRONG SIDE OF THE TRACKS. You can find a link to the DVD below. Be sure you tell your friends and share it on THE FACEBOOK. Thanks. 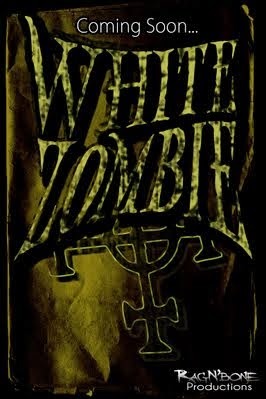 Click here to go to the YOUTUBE PROMO for WHITE ZOMBIE!!! Click here to check out THE HOUSE ON THE WRONG SIDE OF THE TRACKS on AMAZON!! !